More than an upgrade, Artistic Suite V7 contains a wide variety of amazing new features and functionality. 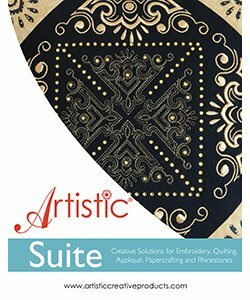 V7 contains all of the capabilities of Artistic Sewing Suite, including cutwork, true type font conversion, applique, fabric cutting, decorative stitches, and heat transfer. Includes a monogram feature- now you can insert 3 characters for monogramming, freely edit monogram shapes with a Node Editor and create a monogram from any True Type Font. Perhaps the most exciting new aspect is the inclusion of a revolutionary rhinestone application. Rhinestones in a variety of sizes can now be added to sewing and crafting projects like never before.